OPERATION : The emergency stop function is implemented with positive making normally closed contacts according to the closed circuit principle. The direct operating switching mechanism inside the switch is of snap action and is actuated when the pull rope is either pulled in any direction or if the rope breaks. After the triggering of the emergency stop function, the switching mechanism locks in the off position. Through manual actuation of the blue reset lever locally at the pull rope switch the switching mechanism is reset to the operating position and the belt conveyor is prepared for start-up. The resetting of the switching mechanism may not start the belt conveyor. With the Kiepe HEN type pull rope switch, the pull rope is symmetrically tensioned on both sides of the red release lever and thus a complete compensation of the rope forces at the release lever is achieved. 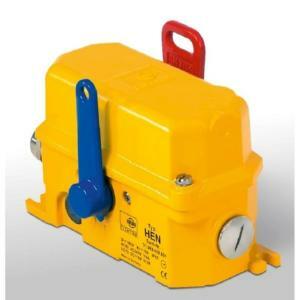 For this reason, double-sided pull rope switches of the HEN design are especially suitable for outdoor use with large changes of the ambient temperature (summer – winter) of up to60°C and more. TECHNICAL DATA : Complies with EN 620, BGI 710 (UVV-VGB 10)DIN EN ISO 13850, EN 60947-5-5, EN 60947-5-1Suited for controls and facilities according to EN 60204Enclosure Aluminium alloy GK-AlSi 12Finish 2 component DD-tile enamel, yellow, RAL 1004Actuating lever, red, RAL 3000Reset lever, blue, RAL 5010Mounting 2 oblong holes for M8 screws Admissible ambient temperature - 25 °C ... + 70 °C Extended temperature range - 40 °C ... + 70 °C for HEN 70x models Protection IP 67 according to EN 60529Switching system max. 3NC and 3NO cam operated switches, positive making, snap action Rated operating voltage Ue AC 240 V, DC 250V Conventional thermal current Ith 16 A breaking capacity.